Egg Omlette is a very common item in our daily meal but fish stuffed egg omlette sounds little different. Fish stuffed egg omlette curry is one of my hubby's favourite dish. So Egg lovers this is yet another delicious and different egg recipe for you. Little turmeric powder and salt apply on rui fish,set it aside for 15 mins. Take a deep non sticky pan, put oil and when the oil is hot, dip the fish pieces in the besan flour and deep fry to golden brown. Drain of pepper towel.Let it cool on room temperature. Then scramble the fish without skin and bone. 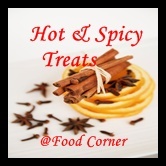 Heat oil in pan, add chopped onion, fry for few minutes then add ginger paste,green chilli, spice powder, salt, sugar, scramble fish, mix well. cook for 5-7 mins.Keep aside. Break 2 eggs in a bowl, add milk, salt, pepper powder and whisk till frothy. Take a flat bottomed pan, drizzle a tbsp of oil, and heat it on medium flame. Pour the whisked egg mixture into the pan and swirl it around to spread evenly. Reduce flame to low and allow to cook for a minute and flip over. Cook for a few second. Flip the omelet again and place the cooked fish stuffing.Gently fold over with a large spatula. Turn off the heat and slide the omelette onto a plate using spatula, carefully close the omelettte. Heat oil in an another pan, add bay leave and cumin seedswhen seeds splutter then add grated onion and fry for a minute. Now add ginger garlic paste, turmeric powder, coriander powder, umin powder, red chili powder and little water . Fry the mixture until oil get separated from it. Add chopped tomatoes or tomato puree and salt . Stir for some time and add 2 cups of water. Finally, Add garam masala powder and sugar. Cover the pan and let it cook for 6 to 8 minute in medium flame. Now add egg omelette in the gravy. Cover it again and cook for another 5 minutes. when the gravy is little thick take it out. Garnish with chopped coriander and serve with roti, naan or steamed rice. 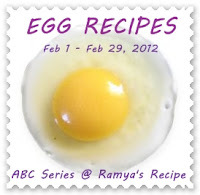 Sending this recipe to Ramya's "ABC Series: EGG recipes" event, Amy's " Hot & Spicy Treats" event, My event "Colourful Holi"